A hat-trick from Dale Hopson, including two goals from the penalty spot helped Spartans move up to third in the Vanarama National League North in a nine goal thriller at Croft Park. 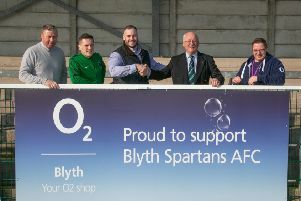 Ashley Chambers had given the visitors a first half lead, but a brace from Dan Maguire, and one of those Hopson penalties, saw Blyth take a two-goal lead into half-time. Niall Heaton reduced arrears early in the second period to give the visitors hope, but an error from Town ‘keeper Dean Lyness saw Hopson make it 4-2, David McTiernan adding a fifth minutes later with an exquisite lobbed finish. Substitute Jordan Laidler was then sent off for a high challenge, before Maguire was hauled down in the area – Hopson completing his hat-trick with a second spot kick. There was still time for Nuneaton striker Chambers to net a consolation, but Spartans took the spoils. Spartans started the game confidently but the first goal of the game came when Chambers round the keeper to find the net. Spartans’ chances were few and far between, but they equalised on 37 minutes when Maguire beat the ‘keeper to the ball and rolled the ball between his legs to level the score. Wrightson was then brought down in the box and Hopson converted from the spot before Magure bagged his second of the game to make it 3-1 at the break. Keeper Jameson made two point-blank saves early in the second half, but Nuneaton pulled a goal backwith a Niall Heaton volley. But Hopson made it 4-2 when he lobbed the keeper for his second on 70 minutes. McTiernam made it 5-2 with a ‘dink’ shot, but then Laidler, after just 20 minutes on the pitch, was sent off for showing his studs in a tackle. The 10-men Spartans battled on and after Maguire was fouled in the box, Hopson completed his hat-trick from the spot. There was still time for Nuneaton to add to the goal tally when Chambers scored with a close range header, but Spartans held out for the victory. Blyth: Jameson, Cartwright, Buddle, Hutchinson, I Watson, Reid (Laidler), McTiernan, Wrightson (Rivers), Hopson, Dale, Maguire.